TOAZOE T119S LED Video Light adopts the newest LED honeycomb design. It has high brightness, nature and soft lights, adjustable color temperature(3300K-5600K). The high definition LCD display let the operation interface is clear. You can adjust the brightness and color temperature steplessly. 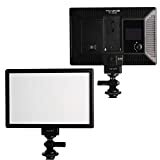 It’s suitable for portrait, children, wedding, etc, supplying perfect and enduring fill-in light when shooting and recording. The hot shoe adopts durable metal baseboard. It can be mounted on DSLR, DV camcorder and tripod. High brightness LEDs are used which are also energy saving, high efficiency, low light decay and long service life. Note: Batteries and DC power adapter is not included. This entry was posted in Discount Photography and tagged 3300K5600K, Camera, Canon, CRI95+, DSLR, Fill, Light, More, Nikon, Panasonic, Photography, Sony, T119S, TOAZOE, Ultrathin, Video by Ball Photo. Bookmark the permalink.